Optoma’s HD29H is comfortably the best gaming projector I’ve ever used. And I’ve spent a long time gaming under the reflected light of a high-powered beamer. One of the biggest regrets I have from moving into my current digs is leaving behind the perfect projection wall I had in the living room of my old flat. I was able to leave my projector permanently in place and beam a huge image onto the wall at will. It was glorious. There was the hungover new years day where I spent three solid hours screaming for The Sound of Music to finish, a full month of playing the entirety of GTA V at almost 1:1 scale, so many iterations of co-op FIFA Career Mode games, and countless hours of PC gaming writ large across the eight years I lived there. Halcyon days. And all those years of projector enjoyment came from using what’s actually not a particularly capable beamer for gaming. That’s because gaming on a projector has traditionally been an exercise in compromise; you have to compromise on image quality, refresh rate, and gaming latency. With the Optoma HD29H, however, none of them is a concern. There are three key specs for the Optoma HD29H which mark it out as an excellent gaming projector: the resolution, the refresh rate, and the level of input lag. While you may look at a 1080p projector as behind the times in this 4K-ready era of ours, it means that you can get serious performance out of even the most modest of gaming hardware. And that’s important when you’re talking about a gaming projector with a refresh rate that stretches up to 120Hz. That’s only accessible using the HD29H at 1920 x 1080, but does mean there will be times where you can get your frame rate mighty close to the refresh rate on the less-demanding of titles. The third key spec is the measured input lag of the Optoma. At just 8.4ms this is about as quick a response as you’ll get from any projector. I know a lot of gamers will look at a TN gaming monitor’s 1ms response time, and the resulting super-low input lag, and conclude it’s going to be vastly superior to this HD29H in terms of gaming speed, and they’d be right. But the 8.4ms input lag here is incredibly low for a projector, and certainly better than even the best TVs used for gaming. 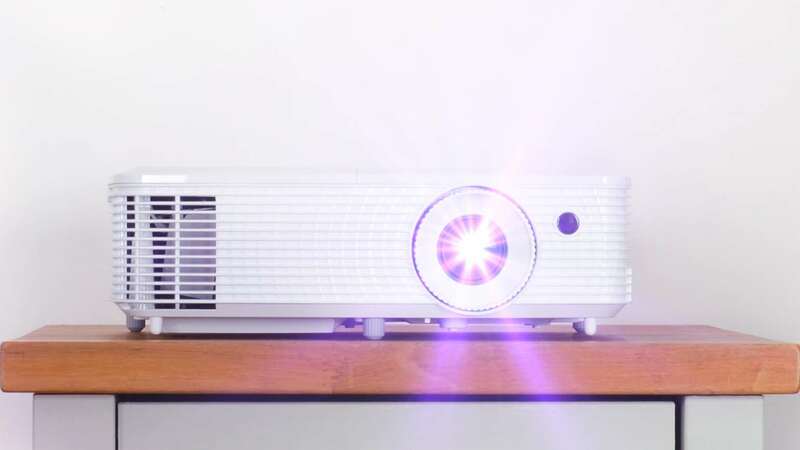 Now, the HD29H is also rated as capable of hitting 4K and delivering HDR visuals but, honestly, if you’re looking at this £700 beamer as some sort of affordable 4K HDR projector then you’re going to be rather disappointed. HDR gaming on PC is an absolute mess right now, with seemingly no-one willing to stand up and sort it out, but that aside the HDR image the Optoma tries to paint is one that’s unforgivably washed out. When you’re looking for the vibrant, detailed colours of a high dynamic range picture the flat experience the HD29H offers really doesn’t inspire. Knocking around in Resident Evil 7, however, was at least better than the bleached picture that you get with blazing Sekiro onto the wall. The dark, foreboding corridor crawling of Resi 7 actually worked out great with the ‘detail’ setting of the Optoma’s HDR menu. But 4K HDR isn’t why you want this projector, because as soon as you get playing at 1080p and 120Hz you will forget any other considerations. As washed out as the visuals might be under HDR settings, the colours become far more vibrant and clear when using standard dynamic range. The HD29H delivers a crisp image – that can be up to 300 inches across the diagonal – and is even bright enough to cope with a moderately lit room too. In pitch black surrounds though games truly pop. The vibrant colours of Trials Rising are magnificent at such scale, and the 120Hz refresh rate means that even at pace it still looks great. It’s the same with Sekiro too, watching your in-game avatar repeatedly murdered because of your lack of skill has never looked so good. The contrast levels of the HD29H are genuinely impressive, and there is very little visible banding to any of the gradients either. The white saturation is seriously good too, but while there is a decent spread in the black levels, the middle tones do get rather samey. 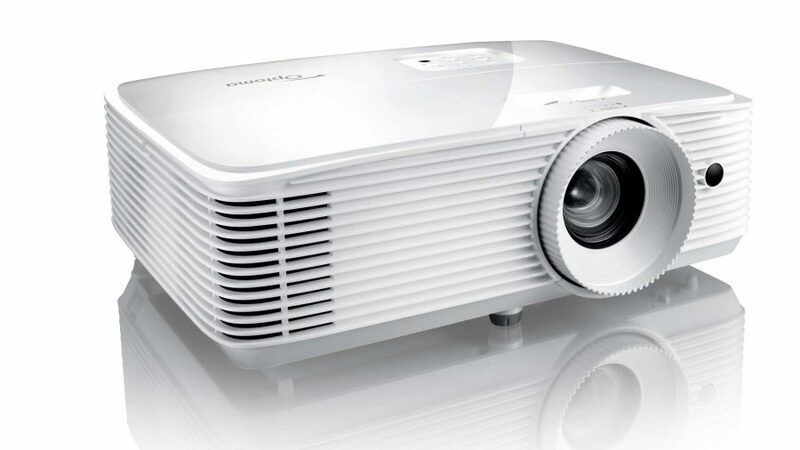 We know of only one other projector that can offer the Optoma HD29H some competition and that’s the Acer Nitro G550. That too has 120Hz 1080p display capabilities, along with the same 8.4ms input lag, but the Optoma clearly has a superior lamp installed inside its chassis. 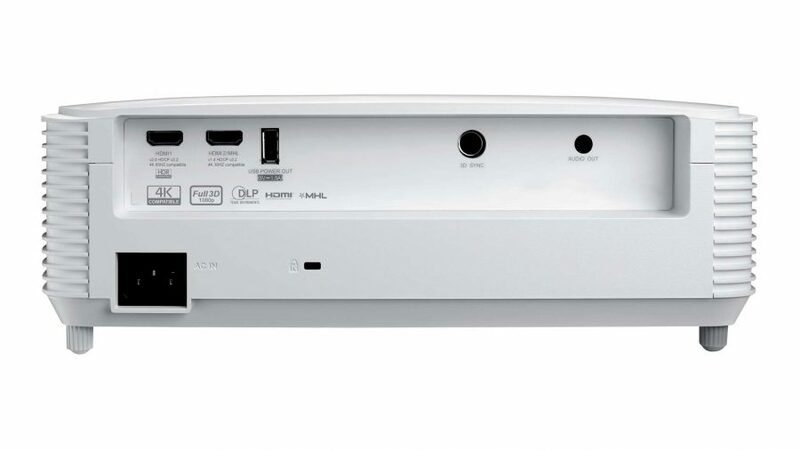 The Acer only has a peak luminance of 2,200 lumens – compared with 3,400 lumens of the HD29H – and also has almost half the lamp life of the G550. There are a few niggles with it, however. It’s not the fastest to switch between inputs, and that delay also occurs when you’re changing resolution or refresh rate in games. Sometimes it takes so long you miss the confirmation menu option and it resets before you have a chance to see what’s going on. 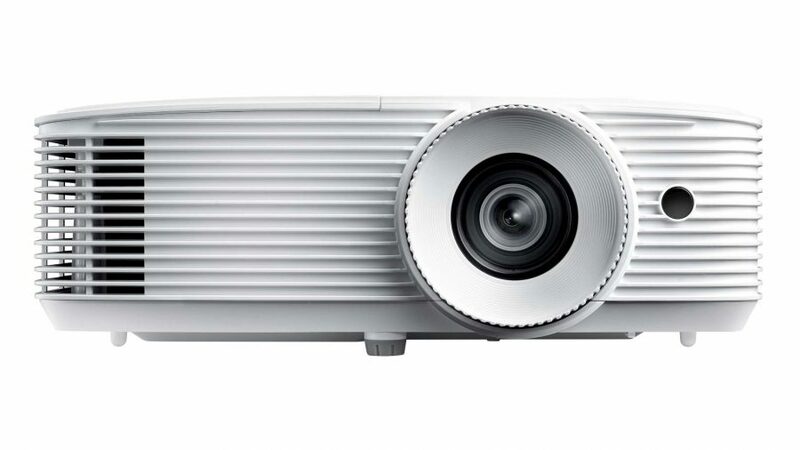 That 10W built-in speaker’s also not much cop, and the HDR performance of the projector is pretty weak sauce too. If you were hoping for an affordable 4K HDR capable device you will probably be disappointed, but if you’re chasing super smooth gaming you definitely won’t be. The only problem then becomes where do you stick it? You need a large room to be able to get far enough away from the wall to make a big image and a place where ideally you can have it set up all the time. But those aren’t issues for the projector, those are your problems. So get over it, because this is the best gaming projector around right now. With the traditional gaming projector issues ironed out, the Optoma HD29H makes for an incredible big-screen gaming experience. The colours are vibrant, the motion smooth, and the image beautifully detailed.